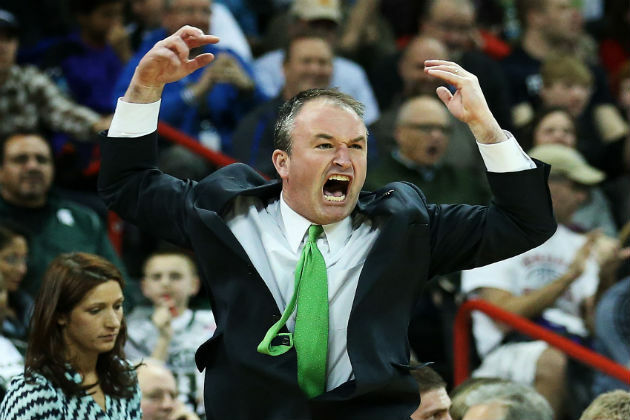 Ohio coach Saul Phillips is frustrated. He’s frustrated with missed shots. He’s frustrated with his team’s effort. He’s frustrated with losing. On Saturday afternoon, his Ohio Bobcats lost their fourth straight game, falling 64-51 to Kent State. “Somebody forgot to tell our shooting ability that it wasn’t a ‘Snow Day’ today,” Phillips said. Ohio (9-16, 4-10 MAC) shot just 35 percent from the field and went 2-of-12 from 3-point land. After trailing 36-25 at halftime, the Bobcats cut Kent State’s lead to two at the 14:31 mark. The Golden Flashes responded with an 8-0 run and claimed the momentum for the rest of the game. Saul Phillips remains upset with his team’s performance. Taylor wasn’t the only one who questioned the intensity of the ‘Cats. After saying the effort during his team’s loss at Miami was “disappointing,” Saul Phillips was in a similar state after Saturday’s 13-point defeat. Devareaux Manley led all scorers with 16 points, including five 3-pointers. Kris Brewer added 11 for the Golden Flashes and Jimmy Hall Jr. scored nine after missing five games with mono. Kent State (19-8, 10-4 MAC) didn’t shoot much better than Ohio at 37 percent, but the Golden Flashes sank seven 3-pointers and held a 39-33 rebounding edge. Kent State scored 17 points on second chance buckets off 11 offensive boards. Campbell led Ohio with 14 points and 10 rebounds, marking his seventh double-double of the season. Taylor finished with 13 points. Maurice Ndour tallied 12 points and pulled down seven rebounds. The Green & White’s poor shooting day was a result of many missed layups and a swarming defense from the Golden Flashes. The victory puts Kent State atop the MAC East. Ohio will look to break their losing streak on Tuesday, February 24 when they host Bowling Green (17-8, 9-5 MAC).